Art Fair Watercolor – Let's Paint Nature! 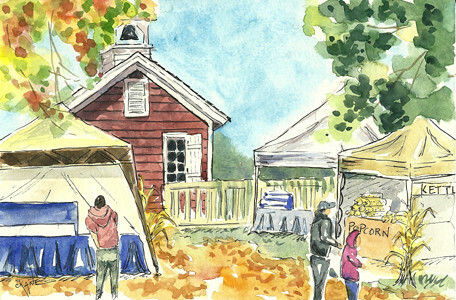 Last Sunday was the art fair at the Little Red Schoolhouse Nature Center. This was my view as I sat at my booth. I must say, I did have the best view! Not only that, but I was right across from the Kettle Corn booth. Every time they made a fresh batch, that wonderful aroma would greet my nose and tempt me. They made it all day long. Needless to say, I had to buy the biggest bag! I’ve been eating it for days now…yummmmmy! I love kettle corn. Hope you did well at your art fair. It looked like a perfect day for it. It was great seeing you at the art fair. MMmm! Kettle corn- I should have bought the largest size, too! Michelle: Thank you, it was such a treat from special visitors!